Alpacas are animals that graze. They come from areas with poor supply of food. So, their digestive system and metabolism are adapted to feeding on poor nutrients, but are fed rich complex feed. In periods of increased growing season (summer, fall), aplacas should be given hay and a high content of complex feed which is not very rich in nurtients to the addition of grass. Alpacas must eat hay all year round with the pasture grass which is the basis of their food. It is important for them to have access to fresh, clean water. Furthermore, the animals should have available enough amount of salt minerals in the form of salt licks. Two bales of hay is a yearly average for each animal. During colder winter periods, you can give complex feed which is richer in nutrients (alfalfa hay). In situations where the animal is weak or in recovery, mares in full pregnancy or lactating, it is best to give chaff alfalfa. Adding feed is a hot topic discussed by breeders of alpacas around the world. There is no shortage of supporters of extreme positions, ranging from “absolutely nothing but hay” to “feeding grains and fruit”. At our breeding farm, we feed with Alpamin mineral feed from Belgium, containing the highest quality of minerals. In winter and spring, and lactating alpacas, we give alpacas Alprophos, hay or alfalfa. Alpamin is completely balanced vitamin-mineral supplement for alpacas and llamas. Alpamin helps with the quality of hair cover, fertility, vitality and resisliance in alpacas. They are tasty granules which should be administered only as a supplement to high-quality fresh grass and hay. These, in turn, must be available for an unlimited amount for the alpacas in order to provide them with a balanced diet. However, Alpamin does not provide energy. In winter (insufficient amount of protein in the hay) and pregnant alpacas, lactating or growing youngsters, it is recommended to use an additional protein supplement such as Alprofos. The high content of vitamin D3, necessary for normal bone development and regulation of calcium to phosphorus ratio. This helps prevent common problems such as rickets. A special coating protects vitamin D3 to the heat generated during the production process so it is not damaged. Len as a source of fatty acids Omega 3 has a beneficial effect on the quality of fur giving it a glow and healthy appearance necessary to be a champion at exhibitions! High levels of bioavailable zinc – essential for healthy skin, prevents inflammation. In order to achieve the highest level of absorption of zinc, it is used in the form of a chelate. Zinc also supports the fight against inflammation of the skin caused by parasites such as Scabies. High levels of biotin which supports coat quality. The correct proportions of other bioavailable trace elements such as selenium and copper to support fertility and the immune system. The correct proportions of calcium and phosphorus which have a positive affect on the growth and production of healthy bone tissue. The supplement is in the form of fine granules whereby the product can be consumed at the early stage of animal life. Alpamin uses the latest technology in animal nutrition. They only use high quality forms of vitamins and minerals to ensure their optimal absorption in the gastrointestinal tract. Alpamin uses the latest technological achievements in the field of animal nutrition. The most valuable of these is the use of chelates. Minerals are absorbed from the intestinal tract through some kind of “gate”. Sometimes different types of minerals choose the same gate. As a result, it is not able to “swallow” too large variety of minerals. That is why many of them are excreted with the faeces. Different minerals compete for it to be absorbed. The solution to this problem is the use of chelates. Chelated minerals are combined with a kind of “carrier” – organic chelator. Alpamin uses the latest and most bioavailable chelated minerals zinc and selenium. To ensure the optimum level of vitamins and minerals, the same dose of Alpamin is used throughout the year. 1 gram per kilogram of body weight per day. Average adult alpaca weighing at 60 kg is administered Alpamin 60 grams per day. Alprofos is a protein supplement in the form of fine granules with an optimal ratio of calcium and phosphorus. Alprofos should be mixed with Alpamin in a ratio of 0-4 units per 1 unit Alprofos to Alpamin as needed. When feeding the herd and to ensure that the more docile animals also receives their dose, it may be increased by 25%. 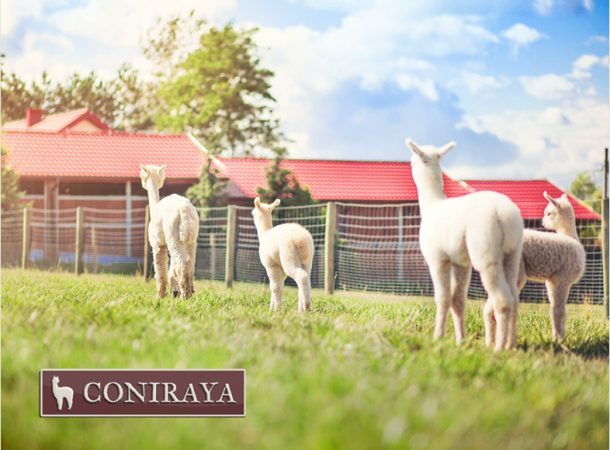 In addition to providing alpacas constant level of minerals and vitamins throughout the year, it is necessary to adjust the level of protein in the diet to the physiological condition of the animals. Ambient temperature, pregnancy, feeding, growth condition of the animal, the quality of grass and hay are several factors for changing protein needs. Feeding systems based on only one supplement at the same time delivering vitamins and minerals and proteins are not ideal. The problem lies in the fact that if we want to increase protein intake at the same time we increase the supply of vitamins and minerals. Therefore, experts recommend separating the supplementation of vitamin-mineral-protein. Thanks to this, protein intake may be adjusted independently. Alpamin and Alprofos are free of genetically modified plants and its base component (carrier) is lucerne (for maintaining proper ratio of calcium and phosphorous).